The Etna-class was a pair of light cruisers originally designed for the Thai Navy(Taksin and Naresuan). The two were requisitioned in 1942 by the Regia Marina and totally redesigned to change them in light cruisers with a heavy focus in AAA. During the Armistice they were 60% completed, captured by Germans and scuttled. 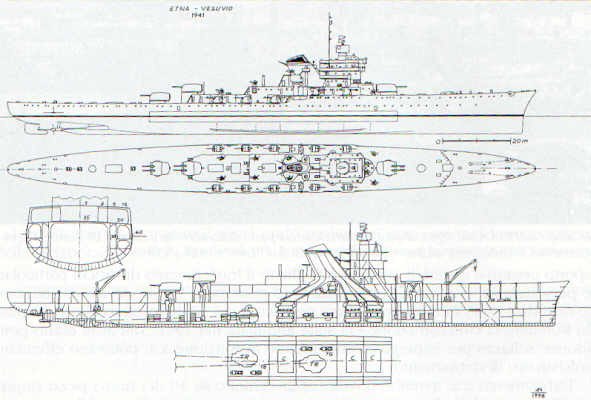 The UP.90 was originally a pocket battleship, modified to be a light cruiser(i may consider the original UP.90 eventually but with the German counterpart at tier IV of the BB line i prefer not, at least for now). She’ll be placed at the same tier of Condottieri V/VI with some advantages(better secondary and AAA) and disadvantages(one less gun in a broadside, less powerful machinery and a lighter displacement which should translate in less HP). Sadly i don’t have data on her protection, i’ll update ASAP.